Johnny Winter produced several albums for his hero, Muddy Waters. Mix the blues from Lightnin’ Hopkins and Muddy Waters, add some precision picking from Merle Travis, gargle with rock salt and whiskey, crank the amps way up, and you get Johnny Winter’s guitar playing and singing. 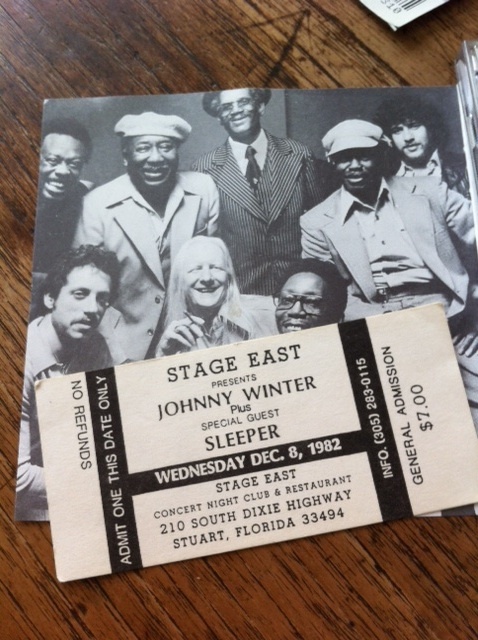 I saw Johnny Winter play a couple of small venues in Florida, including a concert I attended with my friend Steve Nesius at The Florida Theatre in Gainesville. I think I still suffer hearing loss from those shows. Back then, Johnny Winter roared like a jet engine, so loud you could feel his guitar playing inside your body. I always loved how Johnny Winter made Bob Dylan’s “Highway 61Revisited” one of his signature songs, adding the devil’s roadhouse blues to Dylan’s biblical tale. I was introduced to Muddy Waters through those Grammy-winning studio records Johnny Winter produced for his hero. I especially love “Hard Again,” aptly named as a late career boost for Waters. Listen to Muddy shout out on the live record he did with Winter: “I’m a man, Johnny, I’m a man,” part brag, part confession from one master bluesman to another.